Did you know that Cape San Blas is one of the top 10 most spectacular dog-friendly beaches in America? Because dogs love going to the beach and we love dogs, we’re sharing the following tips from a recent Facebook post we made to our page. These ideas will help to keep your dog happy and safe. •	Provide plenty of fresh water and shade for your dog. Bring an umbrella tent for shade and a dog bowl for water. Don’t let your dog drink salty ocean water or they will get sick. •	Sand is HOT! If you can’t walk on it with bare feet, then neither should your dog. Hot sand and asphalt can burn your dog’s paw pads. •	Dogs are able to get sunburned. This is especially true of short-haired dogs and those with pink skin and white hair. Limit your dog’s exposure in the sun. When it is unusually strong, apply sunblock to his ears and nose 30 minutes before going outside. Use a sunblock that is specifically made for dogs. •	Check the daily water conditions – dogs are easy targets for jellyfish and sea lice (microscopic larvae of jellyfish). Sea lice are virtually impossible to see when in the water and the only sign that they are present is the blistering rash they cause. 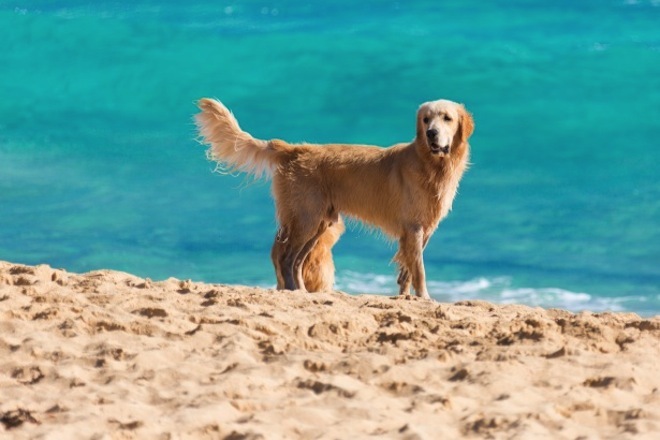 •	Salt and other minerals found in the ocean can damage your dog’s coat. When you are ready to leave for the day, rinse him off with fresh water at an outdoor shower found near most beaches. 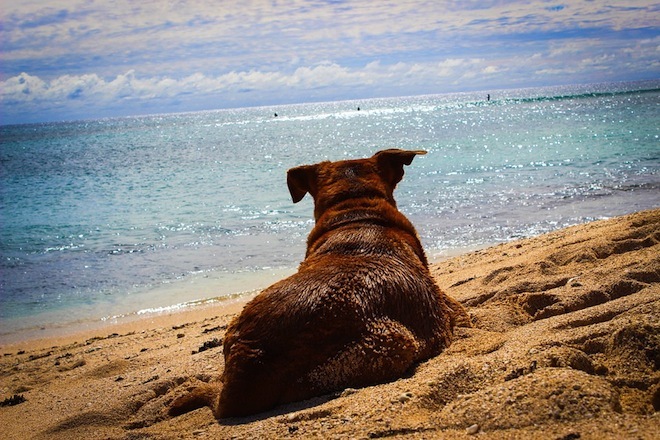 Most dogs can swim and they love it, but if this is your dogs first time to the beach test them to be sure they can swim. •	Never throw your dog in the water. •	Start in shallow water and call your dog’s name, or coax him in with a treat or toy. Always keep your dog within reach. •	Try introducing your dog to the water with another dog that already swims and likes the water. Your dog will learn from the other dog! •	If your dog begins to doggy paddle with his front legs only, lift his hind legs and help him float. He should quickly catch on and will then keep his back end up. •	Swimming is a great form of exercise but don’t let your dog overdo it. He will be using new muscles and may tire quickly. •	Be mindful of strong tides that are hazardous for even the best swimmers. •	Never leave your dog unattended! You should always be in a position to help him out of the water if he tires quickly. There are dogs that just don’t like water. Some dogs can’t swim, but they may learn over time. For dogs such as Greyhounds with low body fat, they can sink (and expend extra energy panicking and trying to swim) and are prone to hypothermia. 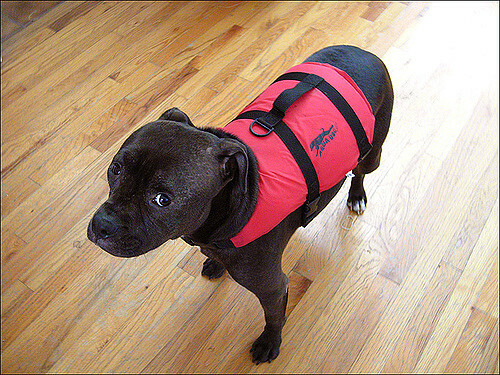 Consider getting them a pet life vest available wherever pet supplies are sold.